Dark tourism is defined as “visitation to places where tragedies or historically noteworthy death has occurred and that continue to impact our lives” Tarlow, 2005:48). Inherently, dark tourism conceptualises the consequence of a long-term conflict. This paper addresses the area of dark tourism in this context, an area which has received relatively little attention by scholars so far, focusing on its relevance to social reconciliation and urban regeneration in a re-emerging tourism economy in Belfast, Northern Ireland. The fieldwork follows a qualitative methodological approach required in order to gather complex information concerning the issue of dark tourism in a post-conflict society. It involves in-depth interviews with tourism decision makers and tour providers as well as participant observation of the tours and sites in Northern Ireland. Dark tourism as an academic concept ascription, rarely enjoys support from governing bodies, official tourism associations and local communities in each specific society. This research points to a polarised understanding of the concept between academic and developed societies on one side, and tourism destination stakeholders on the other, who assess the concept as being detrimental in the process of destination-image-formation which tends to occur after a political conflict. Excluding a small niche segment, this study finds that, in actual fact, dark tourism is not a motivator for visiting the destinations. Yet once tourists are there, most of them would pay a visit to dark tourism sites. Therefore, dark tourism is not a part of the process of image-formation after a conflict. The study instead suggests “phoenix tourism” as an image formation tool, going on to argue that phoenix tourism is not a tourism niche by itself. Phoenix tourism signifies a process of rebuilding, remaking and reconciliation in a post-conflict setting with dark tourism forming a part of that process. Dark tourism is defined by Foley and Lennon (1996:198) as ‘the phenomenon which encompasses the presentation and consumption (by visitors) of real and commodified death and disaster sites’. The phenomenon has drawn substantial attention from academic research in recent years, (for instance Seaton 1996, 1999, Lennon and Foley 1996, 1999, 2000, Miles 2002, Slade 2003, Seaton and Lennon 2004, Stone 2006, Dunkley, Morgan and Westwood 2007 etc) and is becoming widely recognised as a tourism niche for both tourism academia and practitioners. An academic forum, ‘www.dark-tourism.org.uk’, features active discourse and debates regarding the phenomenon. The media is very keen on reporting about tourists visiting war memorabilia sites (Stone, 2006). The problem with the media is that it focuses only on the most sensational part of the phenomenon and usually illustrates it as extremely negative (Seaton and Lennon, 2004). However, the media interest acknowledges that people are interested in those sites and tourism researchers try to find out why the interest has become so prominent recently. Academic discourse regarding this type of tourism has been particularly focused on a certain aspect of the phenomenon of dark tourism. Tarlow (2005:48) for instance, defines dark tourism as having the dimension of the interaction between supply and demand as ‘visitation to places where tragedies or historically noteworthy death has occurred and that continue to impact our lives’. Although research related to the supply-side of the dark tourism continues to flourish, the area which concerns the social component, for instance local communities where the site is located, has been largely neglected within the current literature. Generally speaking, the study of dark tourism lacks a holistic approach. Many researchers have tried to map the motives for visitation to these sites. It has proved to be very difficult, as motives are extremely complex in their nature (Sharpley 2005, Stone 2006, Wight 2006, Dunkley, Morgan, Westwood 2007). Moreover, the theory of dark tourism is assessed to be vague and unnecessarily comprehensive (Stone 2006, Dunkley, Morgan, Westwood 2007). Recent studies of dark tourism are concerned with depicting its concept. Stone, (2006) defines dark tourism as depending on the intensity of the interest and the actual motive to travel to see the site. His explanation the continuation of Miles’s (2002) study, presenting the difference between the actual sites of dark tourism and those sites which are associated with dark tourism. An example of the former is Auschwitz and an example of the latter is the Holocaust Museum in Washington DC. He notes that places which are the actual sites of dark tourism, are “darker” than the places which are only associated with the actual sites. The problem with this and many other studies related to “dark tourism” is their tourism-centric nature (Franklin, 2007), which rarely takes into an account the social settings which influence tourism development within an area. Hardly any research related to the dark tourism phenomenon takes into account recent conflict and the views of those communities who were involved in the conflict. The relationship between the local community, the conflict, and tourists’ visits to the site and not clearly explained, and needs better understanding. Additionally, current research does not elaborate on the idea of ‘recency’, i.e. what is the meaning of the word ‘recent’ in this context? This research therefore defines recent as the status that still has an impact on the lives of the people who live within the area and is still influenced by legislation and regulations which are the consequence of the conflict. Inherently, the consequence of a long-term conflict is conceptualised as a dark tourism phenomenon. This research sets the study in the context of Belfast, the capital of Northern Ireland, where severe troubles and political violence escalated in the period from 1967 to 1995 between protestant loyalists and catholic republicans. This paper sets the discussion in the context of local communities in Belfast which were directly involved in conflict. After the conflict they deal with tourists who come to see the sites. The aim of this research is to understand local communities and their role in the process of generic tourism, and specifically, the development of dark tourism. The violence ended in August 1995 with the Good Friday Agreement. According to this Agreement, tourism emerged as one of six ‘matters for co-operation’ for the North–South Ministerial Council (NSMC) (Greer, 2002), resulting in a creation of Tourism Ireland (TI), an organisation charged with the joint promotion of the tourism of both the Republic of Ireland (ROI) and Northern Ireland (NI) as one single destination. Picture 2. « The Wall », Shankill, Belfast, 2006. Sites associated with relatively recent conflict and their openness to tourism has an impact on a community within the area where the site is located. The early work of Smith (1998) and Lisle (2000) acknowledges the impact conflict has on a society, illustrating a strong link between war and tourism. They depict conflict as part of an area’s heritage. 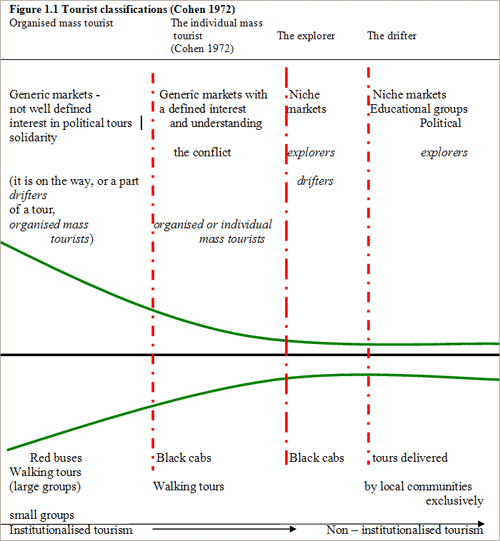 Weaver (2000) presents the influence which war has on a tourism area life cycle (Butler, 1980), explaining that certain phenomena related to war are relatively popular with the tourists and therefore influence the tourism area life-cycle. 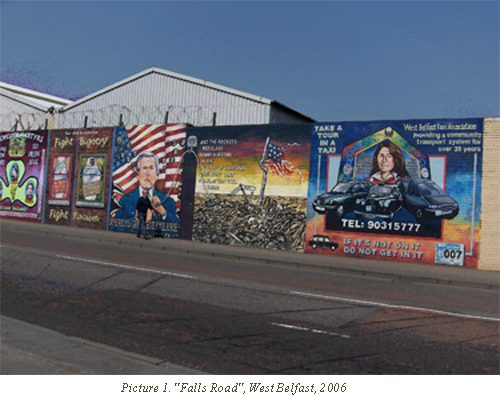 In Northern Ireland, the example of these phenomena were murals, which were inspired by the events during the troubles, but also by world politics and the local historical events which influenced both nationalist and unionist communities (Rolston, 1992). The fieldwork follows a qualitative methodological approach. This is required in order to gather complex data concerning an issue of this type of tourism in a post-conflict society. The main research involved in-depth interviews, which were conducted with tourism decision-makers and tour providers. As an auxiliary method, the research employed overt participant observation of the political tours of Belfast, required in order to enrich the study. The researcher observed three political tours in Northern Ireland and one general city tour of Belfast. She found this important as it provided the study with details which enabled understanding of the phenomenon as a whole and linked the issues. 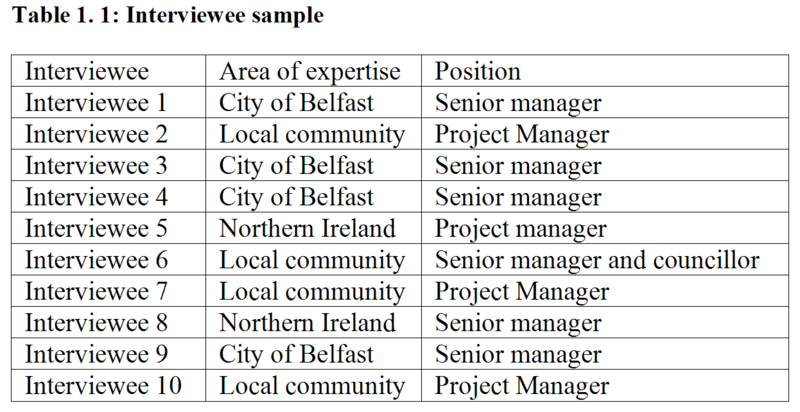 Semi-structured in-depth interviews with ten respondents were conducted over a 3-week period in May 2006 in Belfast, Northern Ireland. The interviewees were selected to represent a wide range of decision-makers within the tourism industry in NI. Most of the interviewees (I1, I3, I4, I5, I9 and I10) worked within the tourism industry during the troubles. I2, I6, I7 started to work in the tourism industry in the period which followed the Good Friday Agreement (1995). I8 joined tourism in NI in 2000. They are all recognised as key players within the industry. Their position allows them to represent the opinion of the employers in the organisation. The study aim was achieved by understanding how people involved in tourism development in the area after a political conflict, perceive the whole process. In that sense, the interview sample is important to the validity of the study. All interviews were digitally recorded and transcribed. An overview of the participants is outlined in the table below. A phenomenological approach was employed in this research. The first step in phenomenological reflection lies in conducting a thematic analysis (Haylar and Griffin, 2005). It gives a degree of order and systematises the task. Ultimately, the interpretive purpose of ‘theme’ is to determine the experiential structures that constitute the understanding, which is considered to be an essence of phenomenological research. This methodological approach consists of the subject of the study (interviewees in this case), the researcher who interprets the meanings and builds it into the theory through the personal reflection, and the process of the phenomenological reflection, which links the researcher to the meanings given to the phenomena (Van Manen, 1990). Through the process of reflection on essential themes, the research suggests phoenix tourism to be a part of a wider conceptual framework which defines tourism development in the context of social reconciliation and urban regeneration after a long term political conflict and includes visitation to the sites of a political significance. The next section explains the identified features separately noting their relevance. We are a community- based organisation, we joined together to deliver this product, it is a market, a niche who wants it. We both share a great interest in facilitating and providing those tours. They want to hear both sides and, of course, that we will join together to deliver that. We understand each other well; both communities are having the same problem, we are from the same world. There is a huge demand from the universities, various peace studies and conflict resolution studies. Republicans were more proactive in that project. But they cannot do it alone as those university groups want to hear both sides. Then republicans contacted us and we started thinking about tourism and political tours as well. We saw the opportunity in that as well. There are the whole university classes. We are not just facilitating republican viewpoints, but we are also facilitating unionist viewpoints, different issues, victims, ex prisoners, a wide range, all sorts of examples. Secondly, both communities were deprived areas with common social problems. Interviewees identified the issues of unemployment, social exclusion and former political prisoners. The issues were common to both communities and they related to each other easily in that sense. According to a Belfast City Council Report (2006), both boroughs are included in the worst 10% in the UK. Tourism is, according to Szivas and Riley (1999) an attractive and accessible employment for people with various set of skills, and labour intensive activity is therefore positively correlated with job provision. Those findings were important for the area which was overwhelmed with the problems of social exclusion and unemployment. In addition, political prisoners have been experiencing legal barriers in finding jobs. Therefore, tourism presents an employment opportunity for this type of job-seeker. Provision of training helps the process of gaining collective self-esteem and confidence which is a prerequisite for any further development. It is very worth, I have to admit…I think more people have training, they have a better background, confidence, and their product will be stronger. The research revealed that economic and social exclusion put political issues and conflict in the background. Although those two communities were in a direct violent conflict for more then thirty-five years, they managed to develop a working relationship and formalise it into a partnership. Tourism was perceived as a neutral in this case as it promoted the involvement of neutral, third party individuals. Political ex prisoners are really discriminated in a way. It is a huge percentage of the population in West Belfast, 15 000 of them went through the jails in the past 30 years. 6 000 of them now live in West Belfast. If it wouldn’t had been a conflict, they would not have been in prison. We see it as a sizable section of our community that was discriminated against in everyday life. They are by majority normal people, political prisoners, not criminals…The toughest remits are to secure employment for them and it was what motivated us to start with tourism jobs. There are two distinct providers of political tours. The distinction is based on whether they are based within or outside the local community. The main difference between them is related to issues of delivery and interpretation. The next section will illustrate the main characteristics of both providers. Providers from outside the communities are official institutions. They deliver a sanitised version of the troubles, a tour appealing to the generic tourism markets. Social and economic benefits from this type of tour do not stay within the community. The community lacks of a tourism infrastructure which is necessary for generic markets. Tourists come in large numbers, but due to the lack of tourism facilities appealing to generic markets, they do not stay within the area. In the communities, there are no hotels or tourism amenities. Furthermore, local communities are not in favour of tours provided in that way. They feel uncomfortable being observed by visitors and in extreme cases are even hostile to them. This is due to a perception that people from the outside (other providers) are exploiting the legacy of conflict. Local communities are concerned with the way the tour is delivered, i.e. verbal communication and mannerisms employed by the tour guides interpreting the issues of the recent troubles. The verbal communication employed by tour guides when delivering the tour is important for the community. Tour guides from outside the community use language and expressions (see examples in the extracts below) which the community often perceives as insensitive and wrong. On the other hand, tour providers originating from the community deliver tours which are more acceptable by local community and which offer evidence of a real reconciliation between those two communities made on tourism. They [tour guides] are using language which is not very appropriate, and of course when local people hear it, they do not like it. These guys starved themselves to death, they committed suicide in jail, and this is not the language. People who pass by, they would stop and say, excuse me!!! They would not be so happy. Picture 3. “Shankill Mural: Titanik”, Shankill, Belfast, 2006. The interpretation given to this issue depends on the context. To I8, seeing red buses on the streets of Belfast, means normalisation. They symbolised a positive change. I1, on the other hand, perceives red buses as exploitation of the legacy of conflict. Excluding a small niche segment motivated by research and education, this study finds that tourism associated with the recent conflict is not a motivator for visiting a community, although once tourists are there, they do tend to visit the sites. However, the money tourists spend while visiting the community does not stay in the area. Developed tourism infrastructure, which would encourage visitors to spend more time within the area, is scarce in the communities analysed for this study. Tourists go there to see the sites and then return to the regenerated area. Therefore, in order to develop tourism infrastructure, more understanding between local communities and local government is needed. A niche market with a particular interest in exploring the conflict consists of university students, as individual travellers, young people as a part of a university group with an educational interest in peace studies and conflict resolution or some other socio-political process, and solidarity groups (Basque, Palestine, Kurds, Catalan, etc.) who share similar political ideology and individuals visiting friends and relatives (VFR) segment. Generic markets tend not to be motivated by political tours, but once in Belfast, they join political tours. These are the leisure travellers who come to Northern Ireland for short break visits and incorporate Belfast city tour in their itinerary, as well as congress and conferences markets, and the VFR segment. To date, local communities have benefited only from the small niche tourism segment, particularly motivated by exploring the legacy of the conflict. They employed local tour guides and local tour providers as they were perceived to have a better understanding of the conflict. These were university and education groups and political solidarity groups, who pre-arranged the tours. Another market segment was political solidarity groups. They share some similar political issues with their own surroundings (prisoners’ issues with Basque County, etc) or they share a similar political philosophy. They are interested to see a community similar to their own. They are particularly interested in the well-being of the community and usually prefer to utilise the services provided by the communities themselves. Both niche groups are a small fraction of all the tourists coming to Belfast. Because constantly people come to our office from all around the world, also students, people doing their PhDs, there is a big demand for knowledge of the conflict. So we needed to create this product. There are whole classes, university classes. One more project we are working on…it is about creating a proper infrastructure, creating proper restaurants, making sure people can come in, shops, as well as hotels, we are also encouraging people to set up B&Bs. That’s exactly what we are all about. Tourism may assist building a local tourism infrastructure and in that way directly influence urban regeneration. Secondly, the communities analysed for this study are deprived, with a lack of pride and self-esteem. Although tourists come to the area to see the sites of the previous conflict, they tend to show interest in the community and their way of life and in that sense bringing pride and self-esteem back to the community. Thirdly, if a tourism infrastructure was to be developed, tourism may boost local small businesses. These three outcomes cannot be conceptualised under the phenomenon of dark tourism and they are not framed by any of its current definitions. Tourists are not generally aware of the meaning of the term ‘dark tourism’. They relate their understanding of a dark tourism to a single product, calling it a ‘political tour’ or a ‘war tour’. The findings from the official tourism institutions suggest that the promotion of dark tourism will ruin the process of re-imaging. Being labelled as dark resembles a pejorative nuance towards the process. Alternatively, it is possible to look upon it from another angle and give another meaning to the whole concept, illustrating that there is a possibility for community regeneration, which may solve some of the already noted community problems. …I know, but the ordinary public would not call it that name. When you call it dark tourism, the ordinary public would not know what it means. That is what you academic people call it like that. There was somebody from your university;she came to speak to me about. When she came over, she was using the terminology dark tourism as well. As a tourism ascription, dark tourism rarely enjoys support from local governing bodies, official tourism associations and local communities. In fact, the concept of dark tourism does not resemble the real role tourism plays within the local communities in Belfast, nor does it illustrate the way in which this type of tourism facilitates the process of community reconciliation and possible urban regeneration. The tourism infrastructure, which potentially encourages visitors to spend more time within an area of Belfast, is a scarce commodity in these community areas. Tourists come to see the sites which are former important sites in the history of the troubles, but they do not stay and take advantage of the services local communities may provide. Their visits to the sites are relatively brief and they quickly return to the city centre. There is a strong evidence to suggest social reconciliation occurs through the process of delivering community tourism products seen through the partnerships of West Belfast and Shankill Communities emerged in order to create and deliver a tourism product. Special attention needs to be given to the tour interpretation, delivery and suppliers. These benefits should remain in the deprived areas. The way forward is through the creation of public-private partnerships, which would include these local communities. This is another issue community planners need to think about. It is not just about bringing new Starbucks coffee shops to the Falls Road, but about supporting locals to start or redevelop businesses of interest to tourists. The local communities will inevitably benefit from these sorts of measures. Furthermore, they may benefit even more as through the general notion of tourism, the communities have started to reconcile with one another. In Belfast at the time of writing, social class division overwhelms sectarianism. The working class communities were not taken into account when tourism strategies were being drawn up. Urban regeneration through tourism happened in selected areas only and the division between deprived and middle class sections of society widened. This emerged as an issue during the researcher’s fieldwork in NI. Although, the researcher acknowledges that these relationships are changing, for example, the Gaelic Cultural Quarter, as a real “tourism cluster” (Boyd, 2000) has emerged in the heart of West Belfast, these examples are still scarce. Local communities have benefited only from a small niche particularly motivated to explore the legacy of conflict. These were university and education groups, and political solidarity groups. They were a small fraction of all the tourists who visit Belfast. If official tourism institutions aim to support local communities in delivering political tours, then it may be possible to say that tourism can help revitalise the communities. In 2006, tourism development was concentrated around the areas which were already privileged with urban regeneration. With tourism development focused only on the privileged areas, the gap between privileged and deprived has become even wider. This research shows that it primarily occurs because these currently deprived communities were not valorised for tourism and leisure purposes before the conflict. A partnership between local community tourism organisations and local authorities which would support tourism development, has not been established. In addition, there is a lack of trust in the communities and their ability to deliver the product. Thirdly, as this type of tourism was not planned to be promoted internationally, its existence was not officially recognised. This paper addressed the dark tourism phenomenon in the context of post-conflict, focusing on its relevance to social reconciliation and urban regeneration in a re-emerging tourism economy in Belfast, Northern Ireland. Having negative connotations perceived by locals, dark tourism should not be a part of the process of image formation and recovery. However, the study concludes that official tourism bodies need to recognise the existence of the demand for knowledge of the conflict, fully integrate and empower the local community in decision making and provide the area with an appropriate tourism infrastructure, resulting in community revitalisation and regeneration. Tourists’ interest in the community sites, suggests that this type of tourism is a chance for local communities to directly participate in tourism development. The example of Belfast illustrates the importance of aforementioned tourism infrastructure in building tourism destinations, with a framework of confidence and trust as a prerequisite in order to have a successful tourism development. With respect to academic discourse, this study finds the concept of phoenix tourism to be more appropriate in the process of destination development after the conflict. This research defines phoenix tourism as a process of destination regeneration, rehabilitation, re-imaging and revitalisation after long – term political conflict. Associated terms with phoenix tourism are ‘phoenix destinations’, ‘phoenix sites’ and ‘phoenix tourists’. It is a part of history; it is what made those places what they are. Phoenix tourism is not another tourism niche; it is a stage, a process associated with tourism development in a post –conflict setting. As the main characteristic of phoenix tourism is social reconciliation and urban regeneration, it does not fit in Stone’s (2006) dark tourism spectrum which is overwhelmingly tourism-centric and does not take into account local communities who were involved in the conflict. The image of a phoenix rising from the flames fits well with the notion of war-torn & socially problematic communities aiming for a new beginning, and a future of regeneration, reconciliation and revitalisation. Picture 1. 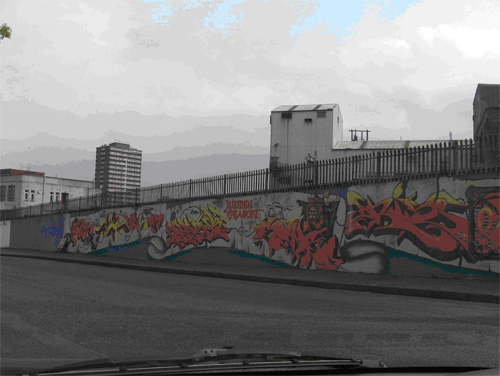 The Wall, Shankill, Belfast, 2006. Picture 2. Falls Road, West Belfast, 2006. Picture 3. 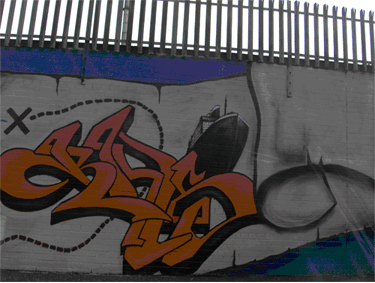 Shankill Mural: Titanic, Shankill, Belfast, 2006. Belfast City Council Development Department, accessed November 2006. Stephen W. Boyd, “Heritage Tourism in Northern Ireland: Opportunity under Peace” in Current Issues in Tourism, 3(2), 2000, pp. 150-174. Richard W. Butler, “The concept of a tourist area cycle of evolution: implications for management of resources” in Canadian Geographer, 24, 1980, pp. 5 – 12. Erik Cohen, “Toward Sociology of International Tourism”, Social Research, 39(1), 1972, pp. 164-182. Michael Crotty, Phenomenology and Nursing Research, Livingstone, Churchill, 1996. Ria A Dunkley, Nigel Morgan, Sheena Westwood, “A shot in the dark? Developing a new conceptual framework for thanatourism” in Asian Journal of Tourism and Hospitality, 1 (1), 2007, pp. 54-63. Malcolm Foley, John J. Lennon, “JFK and Dark Tourism: Heart of Darkness” in Journal of International Heritage Studies 2(4), 1996, pp. 198-211. Adrian Franklin, “The problem with Tourism Theory” in The Critical Turn in Tourism Studies: Innovative Research Methodologies (Advances in Tourism Research), Irena Ateljevic, Nigel Morgan, and Anette Pritchard (eds), Oxford, Elsevier, 2007, pp. 131-149. Jonathan Greer, “Developing trans-jurisdictional tourism partnerships—insights from the Island of Ireland”, Tourism Management, 23 (4), 2002, pp. 355-366. John J. Lennon, Malcolm Foley, Dark Tourism, London, Continuum, 1996. John J. Lennon, Malcolm Foley, Tourism: The Attraction of Death and Disaster, London, Continuum, 2000. Debbie Lisle, “Consuming danger: Reimagining the war/tourism divide” in Alternatives-Social Transformation and Humane Governance, 25 (1), 2000, pp. 91-116. William F. S Miles, “Auschwitz: Museum Interpretation and Darker Tourism” in Annals of Tourism Research 29(4), 2002, pp. 1175-1178. Bob Rolston, Drawing Support 1: Murals in the North of Ireland, Belfast, Beyond the Pale Publications, 1992. Anthony V. Seaton, “War and Thanatourism: Waterloo 1815-1914” in Annals of Tourism Research 26 (1), 1999, pp. 130-158. Anthony V. Seaton, and John, J. Lennon, “Thanatourism in the Early 21st Century” in New Horizons in Tourism: Strange Experiences Stranger Practices, Tej Vir Singh (ed), Wallingford, CABI Publishing, 2004.
International Journal of Tourism Research 2(3): 2000, pp. 151 – 161. Dr Senija Causevic has just received her PhD at the University of Strathclyde, Department of Tourism and Hospitality in Glasgow, on the topic of Post-Conflict Tourism Development in Bosnia and Herzegovina: the Concept of Phoenix Tourism. Senija’s research interests and methodologies include the creation of the emancipatory knowledge through the critical theory research paradigms adopting it in exploring geopolitical, social, economy and cultural context under which tourism exist. This methodology is applied to the discourse of post-conflict tourism development, diaspora, backpacker tourists, the phenomenon and meaning of peripheral tourism regions, cultural tourism, “dark tourism” and tourism seasonality.